Not quite "do or die" for Munster, then. But there is sufficient "don't do enough and die" to ensure that this is merely the latest instalment of a final-round shoot-out in Thomond to whet the appetite for the neutrals and fray the nerves of the locals. It's now an age-old script and one that normally has a happy ending; but even Munster's wildest optimists will freight just a scintilla of doubt as they hoover through the turnstiles in the build-up to kick-off at the sold-out venue. 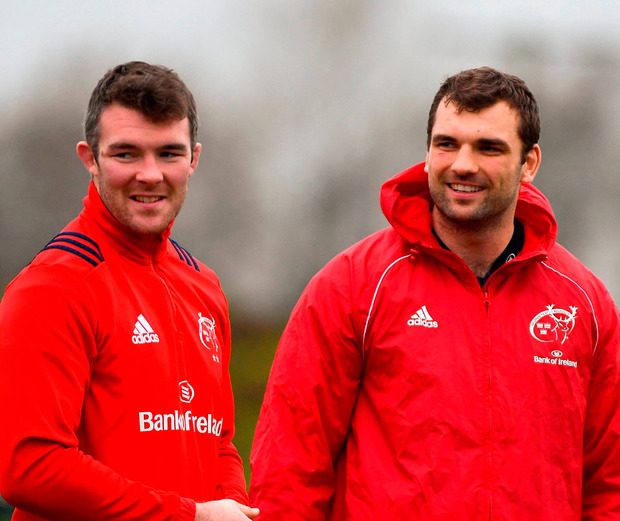 Boosted by the return of their talismanic captain from a rib injury that was deemed serious enough to have rated his chances of featuring at only "50-50" earlier this week, Peter O'Mahony's will to win at all costs will over-ride any sense of doing just 'enough' to survive. Qualification for the knockouts - for an 18th season in 21 - is the minimum requirement around these parts. And, while a top two seeding has always been far beyond their reach given their earlier difficulties in this pool before Christmas when they failed to win on the road, securing a home quarter-final would not just please CEO Garrett Fitzgerald, but also increase the chances of a third successive semi-final, from one in four to three in four. Munster will top the pool and qualify by avoiding defeat or accumulating two bonus points in defeat (ie by scoring four tries and losing by within seven points), or losing by less than seven points and preventing Exeter scoring four tries. Exeter, coming like a steam train again as they did last season before slipping up on the final day, have a better head-to-head record following the sides' opening day draw so any combination of 5-1 or 4-0 in terms of match points would leapfrog them above the Irish side. Munster have grander designs but securing a home quarter-final looks less likely after Monpellier's failure to defeat Edinburgh last night, guaranteeing a home quarter-final for the Scottish outfit. Their best hope is Leinster slipping up in Wasps; Munster's points difference is currently better than their provincial rivals, which may yet be telling. Munster's aim will be to seated on their respective couches tomorrow number-crunching the points of their great rivals. Most factors, not least the intimidation of their fortress, strongly suggest they will fulfil their end of the bargain, not to mention the potent combination of form and fitness which has transformed a side who seemed so sluggish and slipshod when sliding to defeat in Castres late last year. Then again, Exeter, too, are a side seemingly transformed from that which messed up so spectacularly at home, in a run of three defeats, to a Gloucester side who coughed up ten match points against Munster. And Johann van Graan, who recalls John Ryan for Stephen Archer, is keenly aware of the threats from the English side which were not allowed to emerge during the inclement conditions that prevailed in the 10-10 draw at Sandy Park. "I can tell you, they are the best at keeping the ball," says the South African, keen to reference today's referee, one who historically allows rugged and raucous combat at the breakdown where Munster, from Tadhg Beirne to O'Mahony, will seek to stem that possession flow. "Statistically, they do keep the ball the best in Europe and they do keep it for the longest and you've got to respect that. "So your discipline has got to be key. Jerome Garces is one of the best referees in the world and both teams will have to adapt to him. "Once they have the ball they're pretty clinical and you've got to make sure that you keep disciplined and defend well and once you have it you have to keep it as well. Against Exeter, if you get your opportunities, you've got to use them." While Van Graan this week wallowed in the luxury of a fully-fit squad and a meticulously planned player management, his counterpart was keen to point out the ongoing iniquities which the English (apart from Saracens) constantly regurgitate. "Sometimes we hamper ourselves as a competition," says coach Rob Baxter. "We played on a Sunday, they played on a Friday. How does a TV schedule dictate that as being equal? If we qualify, we play on the Sunday before a quarter-final. The same again for the semi-final. "Is the big picture about keeping it a level competition? I think it's madness. Nobody can tell me that is helping us. "It's not just about the PRO14 against us, it's another thing that is being thrown on top of it. There are enough problems for us but that is one that is right in front of me." Whatever, last week's five-pointer at home to Castres means, yet again, they have a chance in round six to end a dispiriting record of four pool exits from five attempts; last year they supinely succumbed when an escape to victory was presented in Glasgow. History and form suggests Munster will repeat the dose. A familiar local tale with an equally familiar ending. Independent.ie Newsdesk Saracens back row Billy Vunipola was confronted on the pitch by a Munster supporter after the Champions Cup semi-final at the Ricoh Arena in Coventry.